Michael Burritt came to Concordia College in Moorhead, Minnesota on October 10th. Concordia’s web-site had announced this clinic as being on October 3rd, but had to be rescheduled to the 10th. This change in schedule worked out great for me since I was now able to make the 3 hour drive “up north” to attend. For avid readers of this blog, Michael Burritt was also scheduled to attend last years’ Day of Percussion which had to be canceled due to flooding. You can read more about that with my earlier blog post. I am familiar with Michael Burritt as an avid contributor to the Percussive Arts Society conventions (PASIC) as well as an author for the Percussive Notes magazine. I also had the opportunity to see him at PASIC 2001 perform the very advanced marimba solo “Escape Velocity 1.4”. For part of the clinic he asked for a volunteer and I raised my hand. I think it was the very bright baseball jersey (American League All-Star Jersey of Minnesota Twins first baseman Justin Morneau from 2007) that caught his eye. He asked me to play some block C chords in my normal posture. Luckily I was having a good posture day and he said it looked comfortable. He then asked me to lean down over the instrument at the hips and play the chords again. I will admit that while standing over the marimba it wasn’t as easy to hear the difference, but the audience definitely could tell that my sound was more open and full when not leaning over the bars. Posture is important not only for long term health but also for the sound that you produce. Try this at home with a partner who is standing back away from the marimba and see if you can tell the difference. Another highlight of the over two hour clinic, was a preview of a new composition of his called “Rounders” which is an advanced percussion ensemble piece available at MostlyMarimba.com. This piece is also required for the final round of the International Marimba Competition 2009 in Paris. Michael Burritt and Nancy Zeltsman are the two American jury members for this competition. 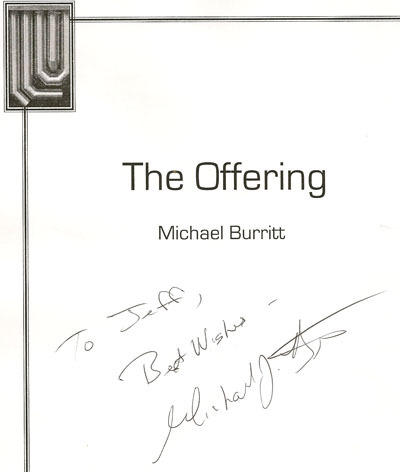 I went up to talk to Mr. Burritt after the clinic and asked if he could sign his composition “The Offering” for me, which he did. Jeff – “By the way, Tom says be sure to say ‘Hi Dad’ when I see you”. Michael Burritt – “‘Hi Dad’? (laughs)”. (Editor note – Michael Burritt and Thomas Burritt are actually cousins). Thanks to Michael Burritt for making the trip to Minnesota, thanks to Dr. Eyler for making the clinic possible, and thanks to Zildjian for sponsoring the event and providing great door prizes! Nice post Jeff! And thanks for the extra “ribbing”… I’m sure I’ll hear about it when I see him in Indy in a few weeks! Hello. Great job, if I wasn’t so busy with my school work I read your whole site. Thanks!